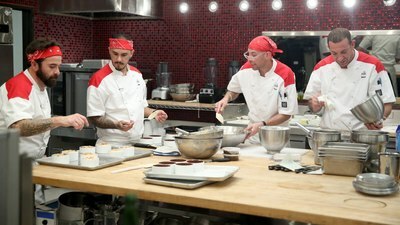 Both teams are down to four chefs each, as the competition continues to heat up. The dining room gets an Italian transformation for one of the most anticipated challenges of the season - the blind taste test. Hell's Kitchen then closes its doors to the public for a special charity dinner service, during which the two teams cook to honor supporters of St. Jude Children's Research Hospital and the Waterkeeper Alliance, with a new five-course Italian menu. The night turns disastrous when Chef Ramsay must step in and finish cooking for one team before a dramatic elimination. Tune in to see one team begin to implode.